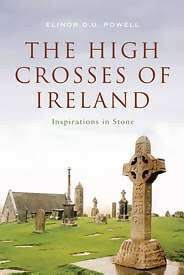 Those great stone crosses standing out in Irelands countryside are the country's greatest contribution to world sculpture, and contain the largest amount of religious carving preserved anywhere in Europe from the last quarter of the first Christian millennium. They are found in what are now churchyards, but were once monasteries of piety and peace which spread Ireland's zeal for learning and scholarship across the European continent. These crosses stand as elegant monuments to a high civilisation, and their shape with the characteristic ring around the head became such a potent nationalistic symbol in the mid-nineteenth century that it was used for grave memorials on both sides of the Atlantic for those who wanted to identify themselves as Irish. . . .
Born in Dublin, Dr Elinor Powell practiced medicine in Victoria, Canada from 1966 until her recent retirement. She has been taking photographs of Irish High Crosses since the 1980s photographs which Colum Hourihane, Dublin-born director of the Index of Christian Art at Princeton University, calls the best he has ever seen.